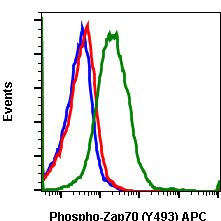 In response to IL-12 binding, the IL-12 receptor activates the Jak kinases, which phosphorylate tyrosine residues of IL-12Rβ2. 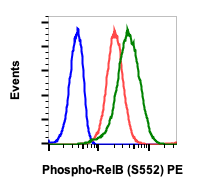 These phosphorylated receptors recruit Stat4 through its SH2 domain, whereupon Stat4 is phosphorylated at Tyr693 in its C-terminal transactivation domain. 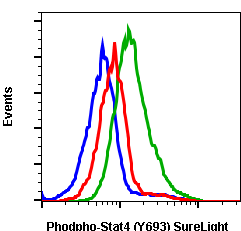 Phosphorylation promotes Stat4 homodimerization and translocation to the nucleus, where it promotes gene transcription. 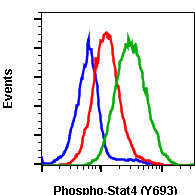 The N-terminal domain of Stat4 appears to be required for maximal stabilization and for the binding of Stat4 dimers to lower-affinity DNA binding sites. 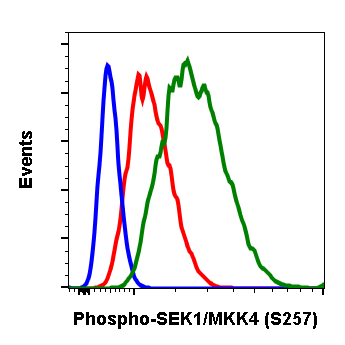 Stat4-deficient mice have demonstrated that this gene is required to both promote Th1 development and inhibit Th2 differentiation due to disabling IL-12 receptor-mediated responses. Kaplan MH, Sun Y, Hoey T, and Grusby MJ. (1996) Nature. 382: 174-177. Chang H, Zhang S, Oldham I, Naeger L, Hoey T, and Kaplan MH. (2003) Journal of Biological Chemistry. 278: 32471-32477. 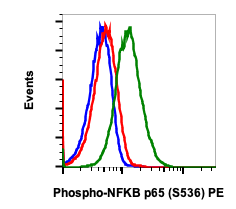 Flow cytometric analysis of K562 cells unstained imatinib treated cells as negative control (blue) or stained and treated with imatinib (red) or treated with IFNα + IL-4 + pervanadate (green) using phospho-Stat4 (Tyr693) antibody Stat4Y693-F6 PE conjugate. Cat #2284.